The MyChron 5 2T features 2 temperature sensor inputs , which can be used to measure the following – water temperature, cylinder head temperature (CHT) / under spark or exhaust gas temperature (EGT). The number of temperature inputs is the only difference between the MyChron 5 and this MyChron 5 2T. The MyChron 5 2T is supplied with ONE sensor: choose between a M10 water temperature sensor, an under plug CHT (cylinder head temperature) sensor or an exhaust gas temperature (EGT) sensor. The optional second temperature sensor is added directly to the dash using the included dual / splitter patch lead. If any further sensors are required these can be added to the system using the AiM MyChron Expansion. 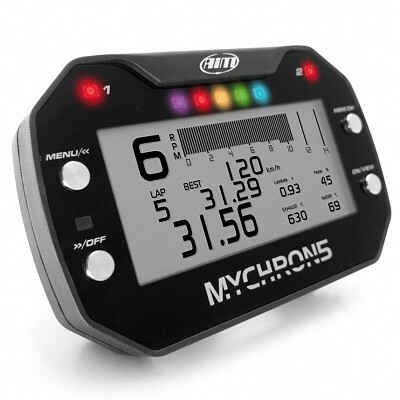 The AIM MyChron 5 2T Dash Logger / Kart Lap Timer is a high-resolution graphical display with built in 10Hz GPS to sample, view and record kart engine parameters and lap data. The MyChron 5 unit is a multi-function system which logs and stores speed, lap times (including split and predictive), gear, temperature, rpm as well as data from the optional LCU-One Lambda Controller and MyChron Expansion module. With 7 configurable display colors to choose from, enabling the driver to view clear, easy to read numerical read outs on track such as lap times and lap number, RPM in a configurable scale and 1 temperature value. Once back in the paddock you can scroll through all relevant data on the display: lap times, with best lap indication, max RPM and max temperature value. Fully compatible with existing MyChron 4 accessories, and up-gradable as your racing progresses with many options which include: SmartyCam HD camera, LCU-One Lambda Controller and MyChron Expansion module. The AIM MyChron 5 Dash Logger / Kart Lap Timer is a high-resolution graphical display with built in 10Hz GPS to sample, view and record kart engine parameters and lap data. The MyChron 5 unit is a multi-function system which logs and stores speed, lap times (including split and predictive), gear, temperature, rpm as well as data from the optional LCU-One Lambda Controller and MyChron Expansion module. The MyChron 5 features 1 temperature sensor input, which can be used to measure one of the following – water temperature, cylinder head temperature (CHT) / under spark or exhaust gas temperature (EGT). The Mychron 5 is supplied with either a M10 water temperature sensor or an under plug CHT (cylinder head temperature) sensor. Additional sensors can be added using the AiM MyChron Expansion. The MyChron 5 has been developed to provide data acquisition solutions to the beginner, showing essential functional information, right through the spectrum to professional teams, who require detailed, tailored and specialized data. Data is recorded to the internal 4Gb memory, and can be downloaded via WiFi to your PC for post-race analysis with the professional Race Studio software.